Running through the Storms: Happy July First! In the meantime, I have two new books that I think will be perfect for your July 4th weekend if you're looking for a new book! Both books receive 5 stars for various reasons and I know you will enjoy them! The first book is by the wonderful and talented author, Karen Kingsbury. The book is titled "Friend of Jesus" which is the second book in her life changing Bible story series. Americas favorite inspirational novelist and #1 New York Timesbestselling author offers a richly told tale about six of Jesus' ;closest friends and companions, bringing biblical truths to life in this captivating continuation of her Life-Changing Bible Study series. In our everyday lives, friends are the people whom we spend the most time with, go through struggles with at times, and who know us best. Each of Jesus friendsPeter, John, Matthew, Judas, Mary Magdalene, and Lazarus traveled with Jesus and were part of His daily ministry, and each has a compelling story to tell. There were some who would question or doubt Him and one would even betray Him. Kingsbury brings these fascinating personalities to life in ways that will not only help bring you closer to the truths found in Scripture, but also to Christ. By combining valuable, instructive Bible study with compelling, insightful character sketches of Jesus companions, Kingsbury provides you with a deeper understanding of the scriptural teachings featuring these fascinating people. Emotionally powerful, thought-provoking, and soulful, The Friends of Jesus will help you to appreciate the Bible and understand how it applies to your relationships with the most important people in your life. Often the Bible can be difficult to read because it is not told in chronological order, which can make it difficult to place people and their stories in the Bible. However, Karen takes all of the guessing work out and puts Jesus' friends into a beautiful woven story that is based off Biblical content in a fictional way. This book is for those who have read the Bible several times and those who are trying to learn about the stories of the Bible. You will find your love for each of the people to grow stronger. In each of these stories you see yourself through the characters of the Bible, but more importantly you see the love Jesus has for each of his friends and how he loves each of us through the stories of these people. I loved reading this book in a fictional way. Additionally, this book can be used for a Bible study, which I think would be great to do with a group of people. I can't say enough good things about this book and I highly recommend it, just like I recommend her first book, "Family of Jesus." The second book that I had the opportunity to review is called "Breaking up with Perfect Kissing Perfect Goodbye and Embrace Joy God Has in Store for YOU" written by Amy Carroll. In certain situations, I really struggle with perfection and I think we can all relate with having a difficult time with perfectionsim. I always want to do my best in all that I do. Every woman has felt the pressure to be perfect. Whether you're a good girl who constantly strives to put on a perfect front or the never good enough girl who finally decides that if she cant be perfect, she might as well be good at being bad, the impossible quest for perfection inevitably results in stress that impacts everything you do. Because what you believe determines how you think and feel, Carroll identifies common misunderstandings about others, ourselves, and God and counters these misconceptions with affirming biblical truths that redefine the source of your worth and help you gain confidence and new ways to think about yourself. In doing so, she helps you rework your thought patterns so that misconceptions like God expects me to live up to His standards perfectly can be replaced with truths like God understands our imperfections and loves us unconditionally. 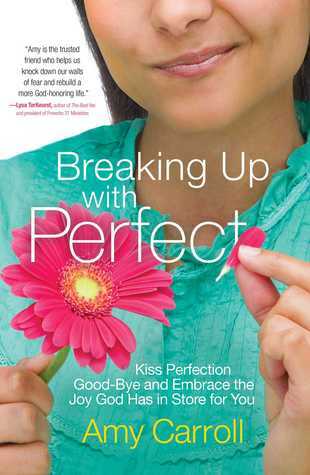 In this relatable book, Amy shares biblical teachings, personal anecdotes, and transformation exercises that are easy to apply to your daily life.Breaking Up with Perfection will give you the tools you need to break the perpetual cycle of stress that chasing perfection induces, so you can live a life filled with happiness, success, and spiritual fulfillment. This book exposes the lies of perfection and how it can entrap one from true freedom. Having said that, I learned a lot about wrong beliefs, values such as relationships with friends, family, TV, Books, internet, my Iphone, etc. I also learned about myself selfishness in dealing with "to do list" instead of spending time resting. Have we all done this? Our "to do list" is a mile long and we HAVE to get it done or else we can't go to sleep! Sometimes, I need to accomplish the list and that can drag me down! The other thing I love about this book is this is the practicalness, but the authenticity of this book. You really get ways to handle perfectionism, but you also feel like Carroll really understand it and has real solutions. I LOVED this book. I felt like she was talking to me the whole time and I really enjoyed the content of this book because I felt like it was very solution focused, but was REAL. This book was so great! Thank you to Howard Books for providing me review copies. I was provided review copies for review purposes only. These reviews are my honest opinion.